Pay Per Click or PPC as it is widely called, is a model of internet marketing in which advertisers pay a fee each time one of their ads is clicked. Essentially, it’s a way of buying visits to your site, rather than attempting to “earn” those visits organically. Search engine advertising is one of the most popular forms of PPC. It allows advertisers to bid for ad placement in a search engine’s sponsored links when someone searches on a keyword that is related to their business offering. A lot goes into building a winning Pay Per Click campaign: from researching and selecting the right keywords, to organizing those keywords into well-organized campaigns and ad groups, to setting up PPC landing pages that are optimized for conversions. Google AdWords is the single most popular Pay Per Click advertising system in the world. 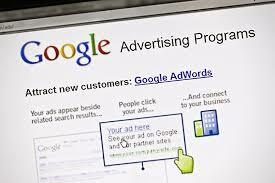 The AdWords platform enables businesses to create ads that appear on Google’s search engine and other Google properties. AdWords operates on a pay per click model, in which users bid on keywords and pay for each click on their advertisements. Every time a search is initiated, Google digs into the pool of AdWords advertisers and chooses a set of winners to appear in the valuable ad space on its search results page. The “winners” are chosen based on a combination of factors, including the quality and relevance of their keywords and ad campaigns, as well as the size of their keyword bids. Search engines reward advertisers who can create relevant, intelligently targeted pay per click campaigns by charging them less for ad clicks. If your ads and landing pages are useful and satisfying to users, Google charges you less per click, leading to higher profits for your business. So if you want to start using PPC, it’s important to the budget that it’s done right. More specifically, who gets to appear on the page is based on and advertiser’s Ad Rank, a metric calculated by multiplying two key factors – CPC or Bid (the highest amount an advertiser is willing to spend) and Quality Score (a value that takes into account your click-through rate, relevance, and landing page quality). This system allows winning advertisers to reach potential customers at a cost that fits their budget. It’s essentially a kind of auction. Pay Per Click, when done correctly, will yield quick, targeted results to a website, landing page, or in some cases result in a direct phone call. The benefit is that it doesn’t take 4 to 6 months to start getting results. For businesses that need and want traffic now, PPC is for them. SEO or Search Engine Optimization is for the long game. The ranking of keywords important to the business takes time. Typically 4 to 6 months depending on how competitive the keyword which is dependent on many factors. The benefit of SEO is that once rankings are achieved, if done correctly, they normally last and your brand is now in front of millions of potential customers and clients for you to engage. Ideally, it’s not a matter of PPC or SEO, but rather PPC and SEO. An effective PPC campaign combined with a well put together SEO campaign can create growth and sustainability for the business owner that desires to have a long term business and a dominant share of the market. The successful PPC campaign can easily pay for the monthly SEO campaign. If you are serious about your business, it’s not “Can I afford to invest in PPC and SEO”, it’s “How can I afford not to invest in PPC and SEO”. While Google AdWords is the highest intent search (Searches for services and products that people know exits), Facebook Ads is more of a “digital bill board” where ads can be place in high traffic areas where they may be seen. People typically aren’t on Facebook looking for services or products so these are not people with “high intent” to buy. They are mainly there to socialize, however with the right ad placed in front of them, at the right time, they can become customers or clients. Facebook is a social platform and it gathers information from its subscribers continuously. Facebook keeps track of page shares, page likes, pages saved as favorites. Facebook also has the record of its members location, where they work, where they’ve worked in the past, their interests, favorite movies and television shows, their politics, almost anything they have decided to share with the platform is recorded. All that information can be used when creating ads in Facebook and in the hands of a digital marketing expert can supply a business with a flood of customers on demand. PPC, Face book Ads, and aspects of SEO are part of the “Marketing Funnel”. The Marketing Funnel has the responsibility of creating awareness and to compel an action on the part of the “potential” prospect (these are not prospects yet) in the marketing funnel. The goal here is to provide enough incentives, intrigue and the appropriate calls to action to get people who are in this large potential prospect pool to take an action such as submitting contact information, calling a toll free number, or other engagement in which these relevant details are captured. The capturing of these details, typically shifts this person from a potential prospect, to a prospect (not necessarily a qualified prospect, but a prospect none the less) and this is the TOP of the Sales Funnel. The Sales Funnel refers to the buying process that companies lead customers through when purchasing products. This is where the prospect can be qualified and funneled to the appropriate area for either more nurturing or to the actual sale. An example would be, by using a questionnaire, a prospect that’s looking for “information” can be identified and then re-routed to a informational video, or FAQ, or free e-book download that provides more information. And because smart digital marketers know audiences are more likely to respond to marketing messages if they see the same message across multiple channels, they use re-targeting in the Marketing Funnel. The prospect will be followed with tailored ads that will remind them and pull them back into the funnel at a more appropriate time of their buying cycle. To increase ROI for businesses we utilize effective Pay Per Click campaigns that include Google Adwords and/or Facebook Advertising to pull in targeted traffic. We create conversion optimized landing pages proven to entice visitors to leave their contact information or call the phone number to the business. Some campaigns visitors are routed to questionnaires to identify customers such as home buyers that meet specifications that Mortgage Loan Officers and Real Estate Agents especially like. We move that targeted traffic through to the sales funnel at which time they become “prospects”. Re-targeting is set up that will follow those visitors that didn’t take action around the web to keep your business and offer fresh in their mind to later pull them back into the sales funnel. The sales funnel identifies and re-route information seekers but pass on “highly qualified” prospects through to the businesses’ sales department or person for the close. This process supplies businesses with an endless supply of customers on demand with high conversion potential. We offer to new clients a unique paid trial service to test run and experience the service prior to making a commitment for monthly services. During the paid trial 100% of client funds are put towards the ad spend. We will create and manage the campaign free of charge. The typical trial period lasts 10 – 14 days. After the paid trial the client can then decide to move into a paid retainer with us or not. For more information and to take advantage of our paid trial service, visit www.expertseogroup.net or call (267) 405-3143. Email us at info@expertseogroup.net.